Issue opens during a Ladies’ Soccer game at Bayville High. As we learn last issue, Jean is on the team. Scott is super supportive of Jean. Spyke is jealous of Kurt and Amanda’s relationship. Amanda is in Kitty’s Chemistry class. I like how the show, and now the comic, paired Kurt with Amanda – and without all that weird backstory. The game comes to a halt as Jean gets a vision of an angel in trouble. 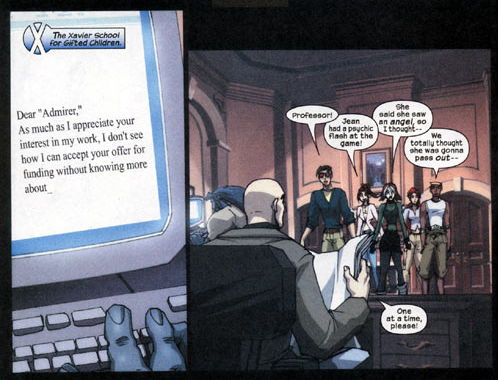 At the mansion, the team informs Xavier of the vision. Xavier shows Jean the front page of a newspaper, with Angel as the headline. Rogue references the episode, On Angel’s Wing, when Scott and her met Angel. 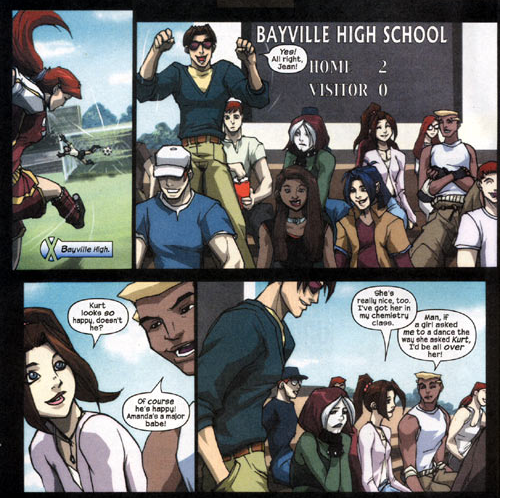 One would imagine that Scott and Rogue would have just told Jean that was probably who she saw, back at the soccer game. There is no real reason to involve Xavier. 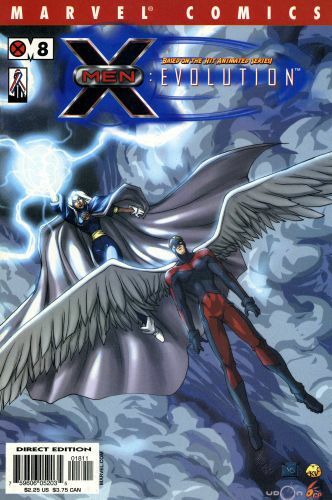 Since they did, Xavier links himself to Jean and they see Angel in the sewers. Once in the sewers, Storm tells Cyclops that he is going to lead the team with this mission. With this story, that is clearly a Morlock story, we get a cool combination. The team that originally met the Morlocks in Uncanny X-Men 169 and 170 – Kitty, Storm and Kurt plus the two members who met the Morlocks first in the FOX 90s episode, Captive Hearts – Scott and Jean. Rogue is there as a bonus (in the comics,she joins the team in the next issue) and Spyke is there to bring things down. The Morlocks do appear in the Evolution episode, X-Treme Measures, for the first time. Storm is suffering from her claustrophobia and Spyke is harassing her about it. Jean chooses this awkward time to ask if she and Scott are okay. It isn’t prompted by anything. I did wish that Evolution was bold enough to pull the trigger on the Scott / Rogue relationship. That I would like to have seen. Instead of answering Jean, Cyclops shouts that he doubts they will find anything down here. Kitty is all for going back home., Kurt too. Jean is puzzled. Rogue figures out what Cyclops was trying to accomplish. There are some great panels of Rogue shooting Jean looks and staring at Scott when he isn’t looking. The Morlocks take the team to their leader, Callisto. Jean runs over to Angel, his mind is mush. She starts trying to piece it back together. Storm and Callisto have a brief exchange. I guess one either recreate their big fight or not do it at all. The Morlocks run off with Storm – I had to read the page a couple times to figure that part out. I didn’t get them capturing Storm. Cyclops orders Nightcrawler and Shadowcat to head the Morlocks off. Jean is to stay with Angel. Cyclops and Rogue are going the direct route after the Morlocks. Kurt and Kitty have a fun exchange. She brought a flashlight, as she was prepared and he is amazed as he didn’t think to do so. The X-Men and the Morlocks all circle back to where Jean, Angel and Callisto are. Angel comes around and yells at Callisto. The X-Men, again, offer the Morlocks a home at the Mansion. They decline, again. Back at the Mansion, Scott gets some kudos for a job well done. Angel asks Jean out, she looks at Scott and accepts. Scott should have answered her question back in the sewer. The issue ends with Kitty and Beast looking at his emails. He keeps turning the grant down. Finally, Xessen reveals they know McCoy is a mutant and that isn’t a deal breaker. Issue nine is on my Wishlist, hopefully one day, I can own it and figure out what that is all about. 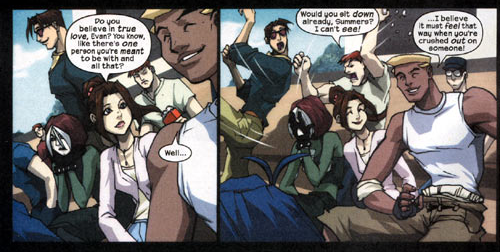 This ends our visit to the X-Men Evolution comic series.